Porter C. Powell is a rival to Isaac Sumdac and one of my least favorite characters in the show because he’s not even a likable jerk. And here’s a story where he’s front and center. Joy. His automotive company makes the SWAT vehicle Bulkhead scanned when he first woke up and decides to cash in on Bulkhead’s fame by selling the vehicle to civilians. It indeed becomes popular but is unsafe for civilian driving (and maybe even for the police given how easily it explodes). Bulkhead has to trick Powell into revealing the flaws in the vehicle. As if I needed another reason to not be interested, The Angry Archer and Professor Princess also show up, so we have yet another story where the Autobots don’t deal with Decepticons or All-Sparked machinery turned evil, and outside of that one scene we don’t even have a supervillain, and I don’t come to Transformers for superheroes and supervillains. Did Isenberg just not want to do a Transformers story? Or maybe he just didn’t want the Autobots fighting anything interesting because the back-up story is just Decepticons, telling how Lockdown and Blackarachnia ended up on Earth. Lockdown is hired by Blitzwing to take out the Autobots that took out Megatron, which he’s willing to do in exchange for Lugnut’s rocket fist. Blitzwing agrees because this version is kind of crazy. 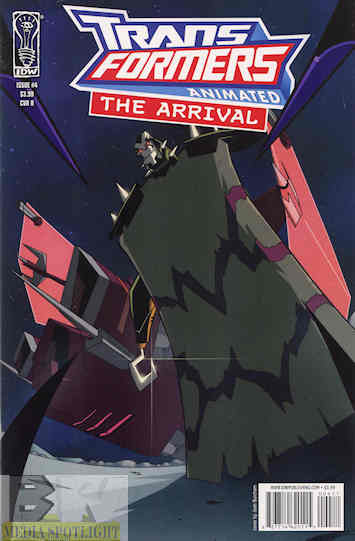 During a search of the Decepticons damaged ship he comes across Blackarachnia, looking for the All-Spark to cure her technorganic existence (although the comic fails to mention this) and she ends up tagging along (without his knowledge despite his offering to work together with her–granted with Lockdown I’m sure he planned to betray her) on the trip to Earth, setting up their separate appearances in the show. This was something I’ve been waiting for in this miniseries, something interesting that involves the Transformers instead of Autobot superheroes. The art on both stories lines up with the cartoon perfectly and could almost be screencaps, which is what I love to see in a cartoon adapted into comic form, not actual screencaps or a failure to match the art style. That may be worth picking up as is the second tale but the main story just isn’t worth it and this miniseries has really disappointed me thus far. We have one more issue to go and I’m sorry I’m ending the Thursday Transformers on this series because it means ending on a low note for me. Posted by ShadowWing Tronix on February 7, 2019 in Animation Spotlight, Television Spotlight, Yesterday's Comics and tagged Blackarachnia, Bulkhead, IDW Publishing, Lockdown, Transformers Animated.